Bet you’re like me, meaning you presume that Israel has some wildflowers, but not that many. Rocks and hills, you know; but not much else. Each time I travel there, What? New this, new that. New butterflies, new wildflowers. Then you travel again the next year, not June, but this time March. OMG! All over again, new butterflies, new wildflowers. 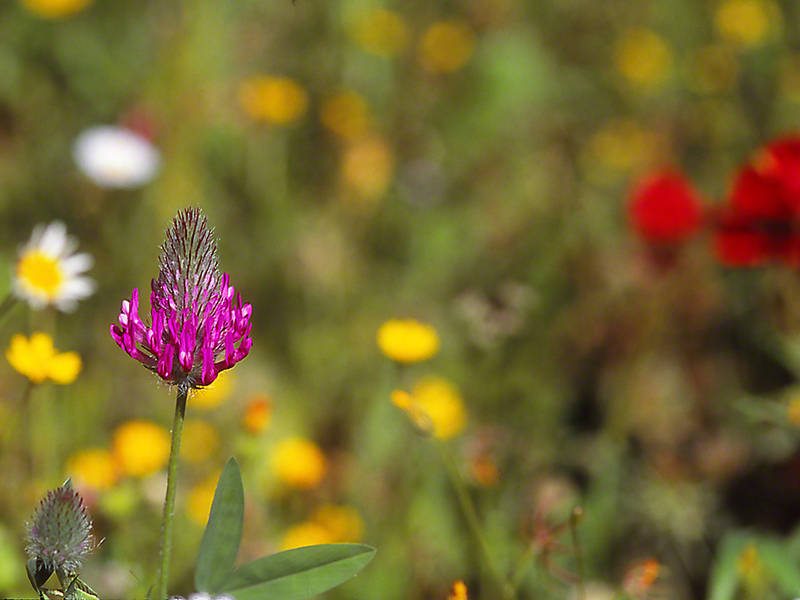 The wildflower in the foreground is the flower head of Purple Clover (Trifolium Purpureum). It was so pert, so richly colored, and so very intricate in pattern and design. Had to stop and shoot, shoot, shoot. This trail in northernmost Upper Galilee region bore March’s huge bounty of wildflowers, a hint of which shines in the background of this image. Flowers from March to May, and it is difficult to pass without the requisite stop and stare. My, my, you are beautiful this morning . . . as the other wildflowers respectfully await their turn for attention. Eye Therapy on those trails at SPNI’s Hermon Reserve. I flew from the very brutal winter in the U.S. northeast, to an Israel blossoming after especially wet winter. Wildflowers were popping up everywhere. I do mean everywhere. March 2015, and I was there to search for rare butterflies. I had been there 3 times before, but never during this Renewal of a March month. It was a feast of color. Oh, if I could have been there with Rembrandt, Peale, Peterson, Matisse, O’Keefe, Chagall and Audubon . . . All would have stopped at these ‘Protected’ Palestine Pheasant’s Ear (Adonis Palaestina) blooms. How I would have loved to hear their shares, as they internalized the rich color, fragile handsomeness and gestalt of this find. Honest. In the Uppermost Galilee, perhaps 200 feet from the Israeli Lebanon border. Verdant, sunny, isolated and carpeted with blooms of many colors. March brought a whole new menu of butterflies. 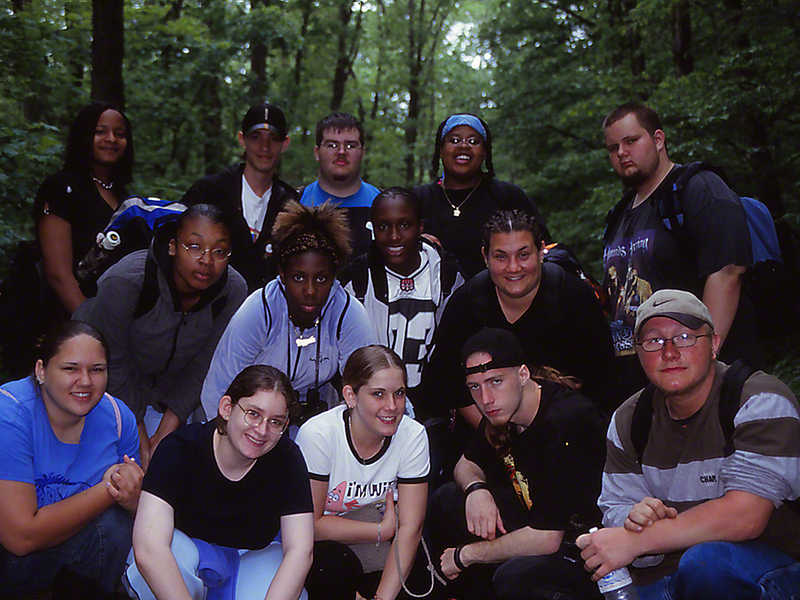 I had been on this same Qedesh trail twice before, but never in March. Expectant. A bountiful basket of butterflies it was. Those blooms must have been pumping nectar hard, because butterflies of many species came up and down the trail, most eating nectar as they went along, other males flying that crazed way that male butterflies do, frenetically searching for receptive mates. 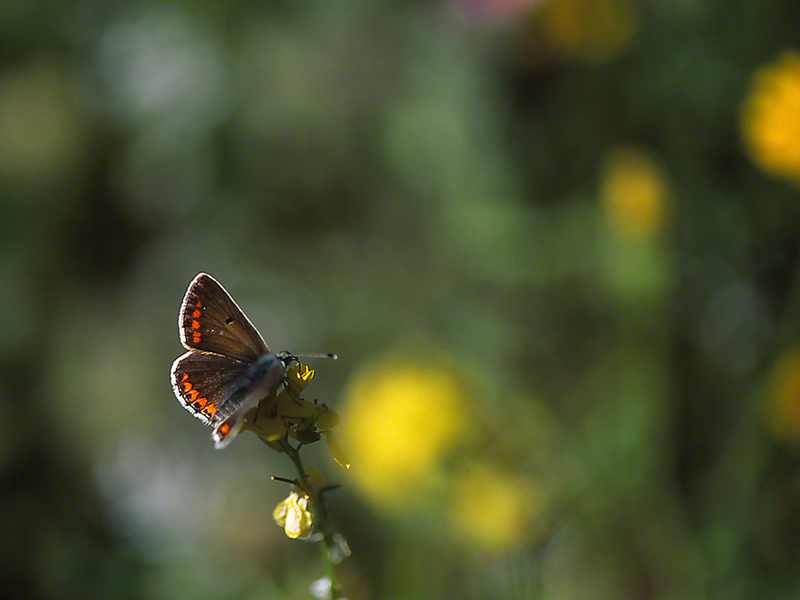 This female, of a species at risk, a brown Argus, gently sipped sweet nectar on this tiny blooms, and her orange margin patches lit up nicely. I lit up also. I was thankful to be here amidst 360 degree beauty, with flying dreams alighting right before my eyes, and a big smile on my face. Alone amidst the Artist’s palette. Sadly, this morning’s news brought the unbelievable report of the torching of a Christian church in Bethlehem, by Muslim terrorists. That was the trigger for this post, hateful madness vs. Joyous beauty. They were standing, here and there along the Qedesh trail in the uppermost Galilee region of Israel. Ghostly remnants of last year’s summer. I paused to admire their thorny bravado. Armed with a thousand long barbs, they continued to stand guard, warning any and all that intercepting this dried plant skeleton remains fool’s errand. Again my Israeli wildflower field guides taunt me, my Hebrew language facility near zero. 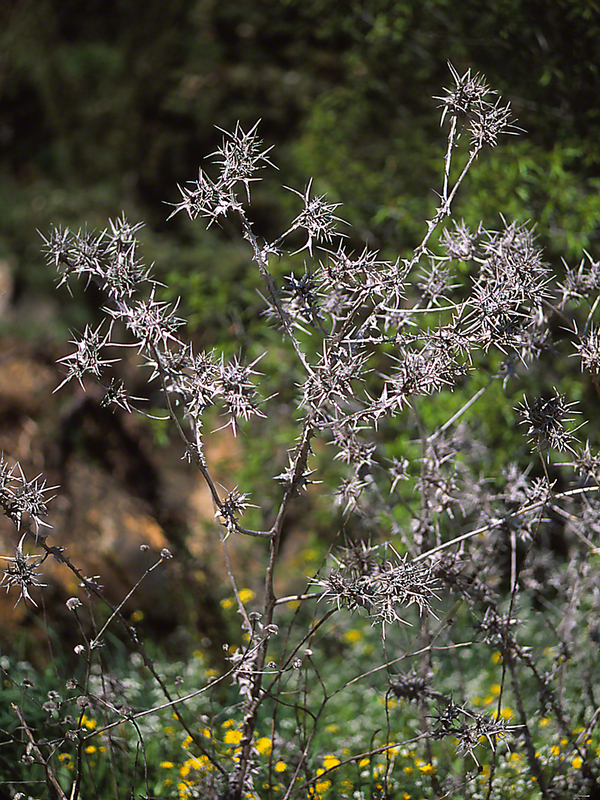 This botanic buzzard may be a Hermon Thistle or another closely related thistle. Here in the States, our thistles often bear thornes, but never such brutal daggers as you see here. That is very typical of many wildflower species growing in the Israeli biome, nearly all desert, until industrious folks figured out ways to irrigate much of it to life. Photographer beware. When you see a flying tiny, Israeli blue butterfly for instance, placing your hands on the ground, to secure a good close-up, risks meeting this or that thorny plant growing flush to the ground. Of course Israel is a challenging place to live (more so with ‘Iran Deals’), and the botany has learned to offset the risks with: Thornes.